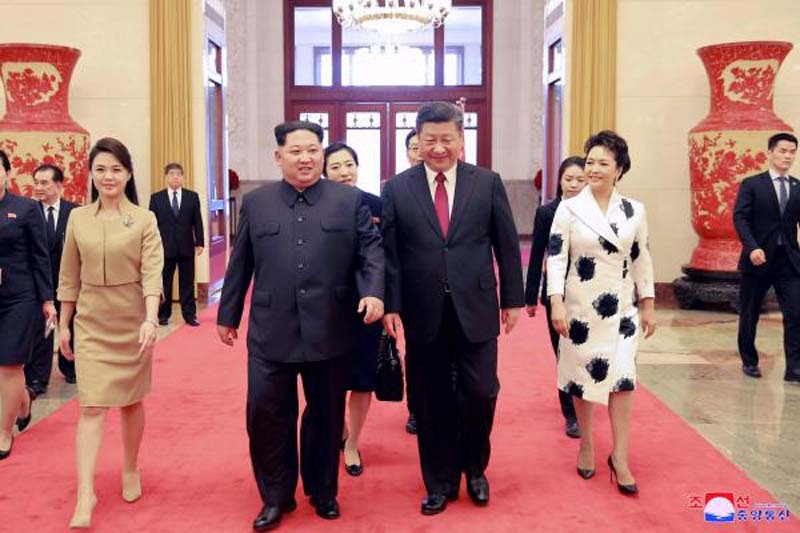 An undated photo released on 28 March 2018 by the North Korean Central News Agency (KCNA), the state news agency of North Korea, shows North Korean leader Kim Jong-un (C-L) and his wife Ri Sol-ju (L) walking with Chinese President Xi Jinping (C-R) and his wife Peng Liyuan (R) during their meeting in China. According to the North Korean media, Kim Jong-un visited China from 25 to 28 March at the invitation of Chinese President Xi Jinping. Photo by KCNA. Chinese President Xi Jinping suggested striking up a peace treaty between South and North Korea, the United States and China, during a phone conversation with U.S. leader Donald Trump last month, Kyodo News reported. [post_ads]The Japanese daily on Sunday quoted various diplomatic sources who said China is hoping to turn the 1953 armistice agreement between the two Koreas into a peace treaty. On March 9, the Chinese leader reportedly emphasized the necessity of China's involvement in talks regarding North Korea's denuclearization, in an apparent move to secure Beijing's grip on affairs surrounding the Korean Peninsula. Trump did not give a clear answer to Xi's request and asked Beijing to continue exerting pressure on Pyongyang, Kyodo News said. South and North Korea are still technically at war as the 1950-53 Korean War ended without a peace agreement. The truce enforced a cease-fire and established the de facto border between the two nations, known as the Korean demilitarized zone (DMZ). By suggesting the two Koreas, the U.S. and China negotiate a peace treaty, Kyodo News suggests Beijing is aiming to launch a four-party body to replace the long-stalled Six Party Talks which included Japan and Russia. Such four-party talks including the U.S. and China were held from 1996 to 1999 under the Kim Yong-sam Administration in the South and the Clinton Administration in the U.S., in order to discuss peace on the Korean Peninsula. However, the discussions broke down as North Korea demanded the withdrawal of U.S. troops form the South, Yonhap reported. Ahead of North Korean leader Kim Jong Un's summits with South Korean President Moon Jae-in this month and Donald Trump in May, the Chinese president met with Kim last week in Beijing. The two leaders are said to have agreed on their commitment to denuclearization and peace o the Korean Peninsula.